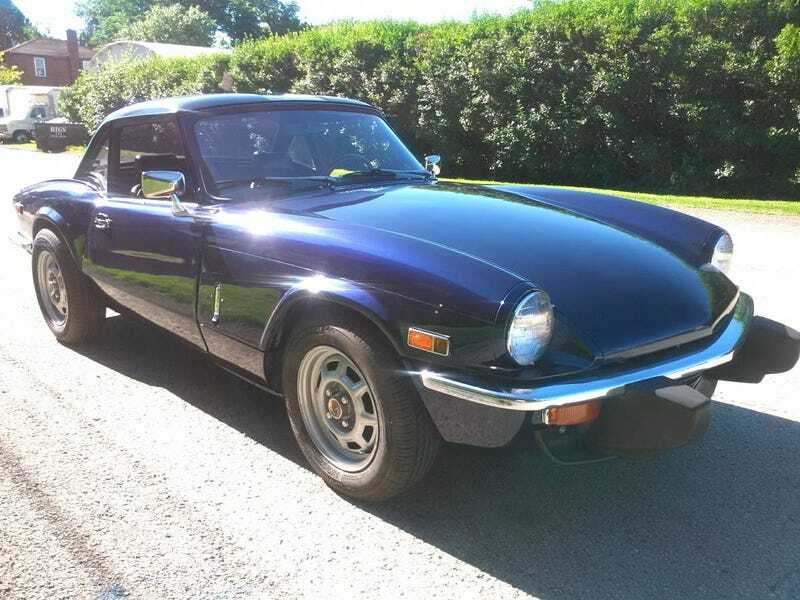 At $3,300, Is This BMW-Powered ‘1980’ Triumph Spitfire a Monster Mashup? Opening the bonnet of today’s Nice Price or Crack Pipe Spitfire reveals not the hoary old Triumph four, but a precision engineered M10 from BMW. Let’s see if its priced to make the switch to a new owner. The Tesla Model S is a big hatchback sedan from a company founded by a guy who claims he wants to change the world. Yesterday we had a 1988 Merkur Scorpio to consider, which in contrast was a big hatchback sedan from a company founded by a guy who DID change the world. One of those cars is for the crazy rich while the other proved accessible even to us poors. No, the Merkur might not have been electric, but it did rock electric seats, mirrors, and windows. Also, when it’s battery goes dead you can pick one up at Pep Boys or even Walmart. Can your Tesla do that, Mr. Musk? Okay, so maybe comparing an old Ford import to Elon Musk’s fever dream electric car is unfair, but at $2,800, that Merkur proved perfectly serviceable to 71-percent of you, earning a well deserved Nice Price win. Let’s take a moment to appreciate weird mashups. Kanye and Kim appear to be of two worlds and yet they seem to be making it work. Opposite political opinions don’t seem to constrain admiration or friendship either, at least in the case of Supreme Court Justices Ruth Bader Ginsburg and the late Anton Scalia. They shared an affable relationship outside the court despite incompatible views on the bench. Yep, unlike oil and water some things just seem to go together even if you might thenk they would not. An example of this is today’s 1980 Triumph Spitfire, as it has been imbued with the drivetrain and even the wheels, from a BMW 2002. And you know what? It all seems to work. I do admit, it may seem incongruous. After all, in WWII, Spitfire fighter planes fought against the Germans and were powered by Rolls Royce engines. Now however, the Germans own both Rolls and Royce, and this Spitfire—the legendary aircraft’s automotive namesake—gets its own German motor. That’s an amazing confluence of coincidences. Now, let me start out here by pointing something out—this does not appear to be a 1980 Spitfire. Those cars had massive plastic covers on their bumpers, while this one does not. This car does appear to have at least been built after March of 1977 as it sports the later, TR7 style steering column, but unless it’s been retrofitted to earlier bumpers, it’s not an ’80. You know what, who cares? It’s still a pretty cool old roadster, and I should know, I owned one of these at one time. It was awesome, when it ran. Much of the mechanical maladies of the Triumph drivetrain have been exorcised here however, with the adoption of an M10 SOHC four from a BMW 2002. That car’s four-speed manual gearbox has made the move as well. BMW’s 2-litre M10 would have pumped out 101 horsepower out of the box, and this one has been imbued with a pair or 42DCOE Weber side-draughts so perhaps it makes even more. I’ll bet it at least sounds good. Both engine and gearbox required bespoke mounts and the latter demands a new transmission tunnel. All of that work is claimed to have been done two decades ago by a previous owner so you can be assured it’s probably not going to all unravel on the drive home. The rest of the car seems to be in reasonable shape. The ad claims there to be ‘very little rust’ with no structural issues at all. It comes with the hardtop, which is said to require a respray. The softtop goes unmentioned and the car is presented closed so there’s no way to know its condition, or if it even exists. On the inside things present pretty similarly. There are a couple of extra gauges in the wooden plank of a dash, and there’s the oddly incongruous Bimmer shifter poking up between the seats. The tach works, and while the speedo does as well, it’s not calibrated for the drivetrain. Also, the fuel gauge is apparently only for show. The seller thinks the two buckets are ‘old alpha romeo’ but they are in fact proper Spit seats. The boot is missing its fiberboard fuel tank cover and floor, but is otherwise serviceable. I don’t remember there being a windshield washer bottle in mine, however. The ad notes that the engine ‘starts, idles, runs.’ It does suffer from an oil leak around the exhaust manifolds, which is something that has me scratching my head. The seller says it’s a common malady of the M10. There’s some other fiddling to be done under the big clamshell bonnet, but nothing that might scare you away. Easing the burden perhaps is the addition of the seller’s trash pile… oops, I mean parts collection. That includes an extra M10 head, gearbox, custom header and even a wiring harness. All in all it seems a laudable booty. The asking price is $3,300 and should you be familiar with the current state of Spitfire pricing you’ll know that good condition cars can and do go for double or even triple that. This one is a bit frayed around the edges and it’s kind of weird with the BMW bits. I think that it’s weird in a wonderful, attractive way, and so we now need to decide if its price is likewise. What do you think, is this M10 Spitfire worth that $3,300 asking? Or, is this a mashup that was never meant to be mashed? Pittsburgh, PA Craigslist, or go here if the ad disappears. H/T to Patrick George for the hookup! At $2,800, Do The Stars Point to This 1988 Merkur Scorpio Being a Great Deal?